While there are many student consulting groups and various feminist organizations on Penn’s campus, Becca Bean, C’21, W’21, and Sarina Divan, W’21, saw a gap in the intersection between the two and started a club to fill it. 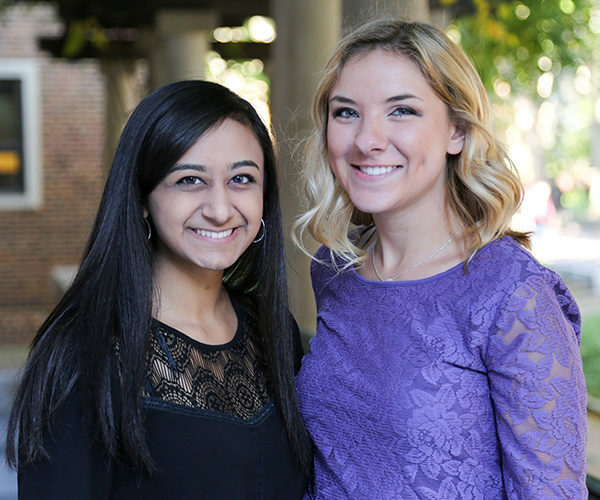 The Gender Balance Consulting (GBC) Club founded by Becca Bean, C’21, W’21, and Sarina Divan, W’21, is the first student-run gender consultancy in the country. The Wharton sophomores have high ambitions for the organization. Their inspiration dates back to before Becca and Sarina started their undergraduate careers at Wharton. Although they attended different high schools, they first met in their senior year of high school as Teen Advisors for the UN Foundation Initiative “Girl Up,” a global movement of empowered young women leaders who defend gender equality. As Teen Advisors, Becca and Sarina were central to Girl Up decision-making including advocacy, fundraising, and communications strategy. Fast forward one year, and they both ended up at Wharton. Becca was involved in Global Research Consulting as a Project Leader and in Own It (a women’s leadership club). Sarina was involved with the Penn Wharton Public Policy Initiative. When the two of them met up, they both wanted to get involved with something that would allow them to have greater impact. Given their commitment to this belief, Becca and Sarina faced a dilemma when thinking about how to execute their idea. At first, they considered pitching their proposal to form a separate branch within an already-existing club, but they felt that by doing so, they would reduce the importance of the issue of gender balance to a secondary concern; establishing GBC as a stand-alone organization emphasizes the importance of the club’s mission and goals. In addition to their focus on gender balance, Becca and Sarina are differentiating their club from other student-run consulting groups by working not only with external clients, but also within Penn itself – after all, gender balance also remains a pressing issue amongst student clubs and the Penn community at large. They use a wide variety of diagnostic methods and tools to assess an organization’s gender balance, which they learned about from Lauder alumna Jennifer Shannon Flock, WG’18, G’18. When they reached out to Jennifer, who at the time was the COO of gender consultancy 20-first, Becca and Sarina learned about quantitative and qualitative methods to measure gender balance. They have already had a student group reach out to them for their consulting services, and will soon begin working with local coffee chain Saxbys on assessing their gender balance, but their work is not limited to advising and consulting – they are also engaging the Penn community in learning more about the topic of gender balance. Additionally, they want to expose the undergraduate community to prominent figures in the field of gender balance. The club recently hosted Stephenie Foster, L’86, in a discussion on how and why business can focus on gender equality. Stephenie is a partner at Smash Strategies, a consulting firm that works with organizations to leverage their commitment to women and girls. Becca and Sarina have gotten off to a strong start, and they credit part of their successes to the resources available at Wharton. Through her connection with the Wharton Social Impact Initiative (WSII), Becca ran the idea for GBC past an employee in the initiative, and also got in touch with an expert in gender lens investing that she met on a WSII social impact business trek last year. In their first General Body Meeting (GBM) of the semester, Becca and Sarina demonstrated gender jaws, a diagnostic method for accessing gender balance. A gender jaws graphs shows the number of members in an organization at different levels of its hierarchy, with one line representing men and one line representing women. The reason the graph is called gender jaws is that in most organizations, at the lowest level of the hierarchy the number of men and women tends to be similar, but as you move to management and C-suite positions, the number of men tends to increase while the number of women tends to drop, forming two lines that look like jaws. The way they presented this at their GBM was by applying this concept to Wharton clubs. In advance of the meeting, the sophomores reached out to all Wharton undergraduate clubs asking for a breakdown of the clubs’ memberships by gender at the general member and board levels. Those attending the meeting then used that data to form gender jaws graphs, which not only gave them an insight into the state of gender balance across Wharton student groups, but also showed them how easy it can be to measure gender balance within any organization.